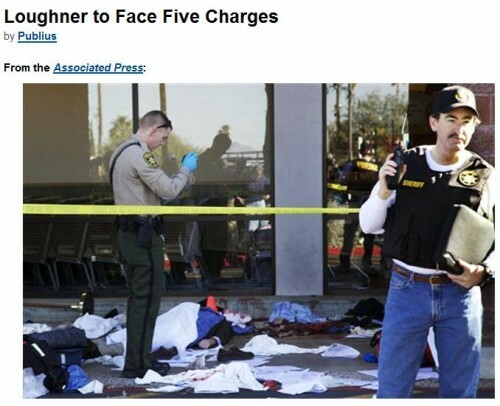 Lunatic Jared Loughner Wanted to Kill Cops... He Must Be a Tea Partyer! Lunatic Jared Loughner Wanted to Kill Cops… He Must Be a Tea Partyer! We already knew that the Tucson shooter Jared Loughner was an anti-Christian, anti-Constitution, left-wing, pro-Marx, antiflag, “quite liberal” lunatic. Today we found out that he also wanted to kill cops. Loughner will face 5 charges of murder. Jared Loughner wrote on his My Space account last month that he wanted to kill cops. Another Pima classmate, Lydian Ali, said Loughner would frequently laugh aloud to himself during the advanced-poetry class they attended. Only about 16 people were in the class, so Loughner’s behavior stood out, Ali said. “It almost seemed like he was on his own planet, because his comments would have nothing to do with what we were talking about,” Ali said. The online accounts also contain bizarre discussions of a new currency and literacy, as well as threatening and despairing messages.